International Mountain Guides takes clients up the tallest mountains on all seven continents, with Kilimanjaro, Everest, Rainier, Mount Whitney, the Matterhorn, and Elbrus ranking as some of the most popular. Since 1991, IMG has helped 300 clients to the summits of 8,000-meter (26,248 feet) peaks, including 179 on Everest  37 of those earlier this year. 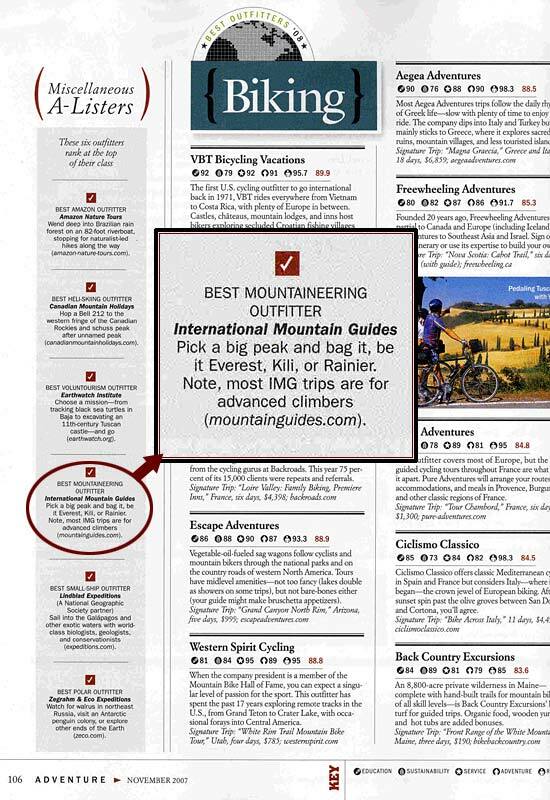 If you haven't figured it out yet, many of IMG's expeditions are for advanced mountaineers. Prepare for world-class guiding  Dave Hahn, for instance, has summited Mount Rainier 223 times and Everest nine times  on classic routes or one of the handful of annual exploratories in Alaska, the Yukon, and Washington's North Cascades.